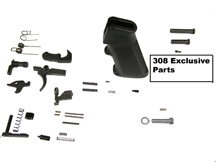 DPMS LR308 AR-10 Lower receiver parts kits. << Back DPMS LR308 AR-10 Lower receiver parts kits. Pistol Grip, Trigger, Hammer, Disconnector, Selector, Bolt Catch Spring, Detent Spring, Bolt Catch Buffer, Take Down Detent, Bolt Catch, Magazine Catch Spring, .308 Bolt Catch Screw, Magazine Catch Button, Magazine Catch, .308 Front Pivot Pin, Hammer Spring, Trigger Spring, Pistol Grip Screw, Pistol Grip Lock Washer, Selector Spring, Detent Selector, Hammer Pin, Trigger Pin, .308 Take Down Pin, Buffer Retainer Pin, Buffer Retainer Spring, and Disconnector Spring.